You have some important messages that you wouldn't accidentally delete or lose them, so you want to back up SMS to computer for future records. 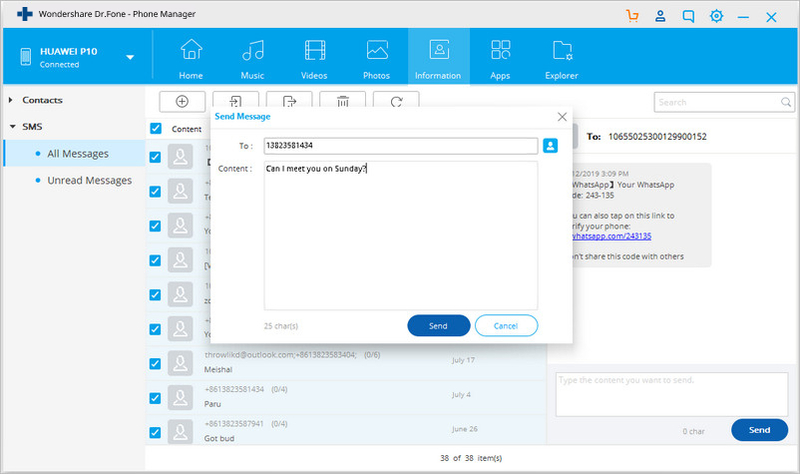 You want to type out messages by using keyboard and send them out from your PC to single or multiple contacts. Messages in your inbox start to swell and you would like to delete messages quickly and conveniently. Whatever situation you may be in, the most important thing you care about must be what kind of SMS manager for Android is right for you. Here, I'm going to show you a great Android SMS Manager. One-shop Android SMS manager to let you save, send, delete and view SMS - just as a breeze. 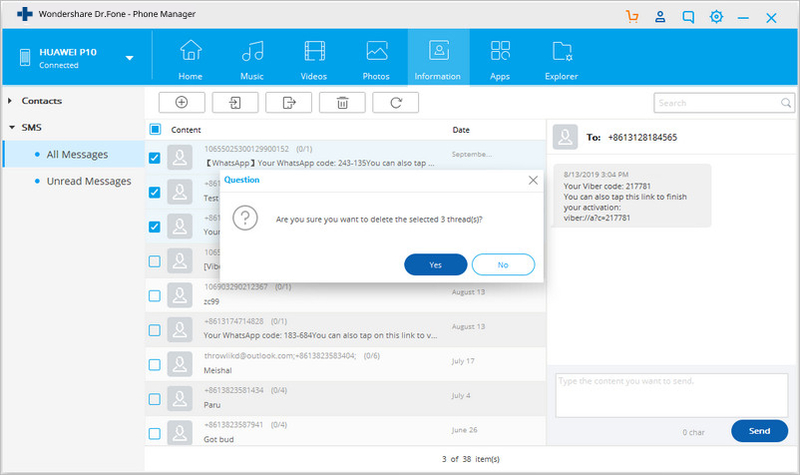 Send SMS messages directly from computer to one or more friends. Export all or selected SMS threads to the computer and saved as TXT/XML file. Imported SMS in XML file that you exported with dr.fone for restoring. Select any SMS thread and view detailed messages conveniently. Hand off phone call and send a message as a reply when you're busy. Share your favorite apps with your friends, families via SMS. Delete multiple unwanted SMS and threads at a time to free up the inbox. Work well with Samsung, LG, Google, HTC, Sony, Motorola, HUAWEI, etc. Note: The Mac version doesn't let you hand off phone call and send a message as a reply. Too slow to type and send messages on a small screen of Android phone? You don't have to. dr.fone - Transfer (Android) empowers you to directly send messages from the computer conveniently. Additionally, with it, you don't have to type and send the same message to many friends. Instead, with you can text all of your friends with a single piece of the message. Besides, it even enables you to hand off a phone call, and send a message as a reply. This makes it quite convenient for you when you're too busy to answer a phone call. Navigate to the Information tab of the primary window, and click SMS in the left sidebar, then click New. A dialog comes out. Click the cross icon to select the persons you want to send messages to. Then, click OK. Type the messages and then click Send. Want to backup important SMS messages in case you might delete them accidently? It's easy to handle it. Go to the left sidebar and click SMS. Select the SMS threads you want to backup. Click Export > Export all SMS to computer or Export selected SMS to computer. In the pop-up computer file browser window, click Save as type. In the drop-down list, select a type – HTML file or CSV file. Then, click Save to save SMS from Android phone to computer. One day when you lost the SMS or when you get a new Android phone, you can import the CSV or HTML file you saved with dr.fone. Click Import > Import SMS from computer. Navigate to the folder on the computer where the CSV or HTML file is saved. Then, click Open to import it. Your SMS inbox is full, and you can't receive SMS any more? It's time to delete unwanted SMS message and SMS threads. 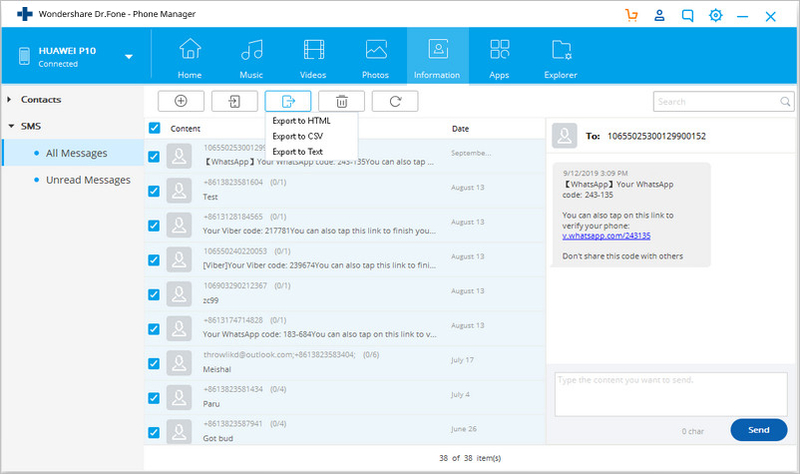 By clicking SMS, you enter the SMS management window. Delete pieces of messages in a thread: View the pieces of messages and delete your unwanted ones. Delete Android SMS threads: Tick the threads you don't want to keep any more. Then, click Delete. In the pop-up dialog, click Yes. We have discussed what easy ways are out there to transfer photos Android to Mac. Check the three ways about how to transfer photos from Android to Mac. 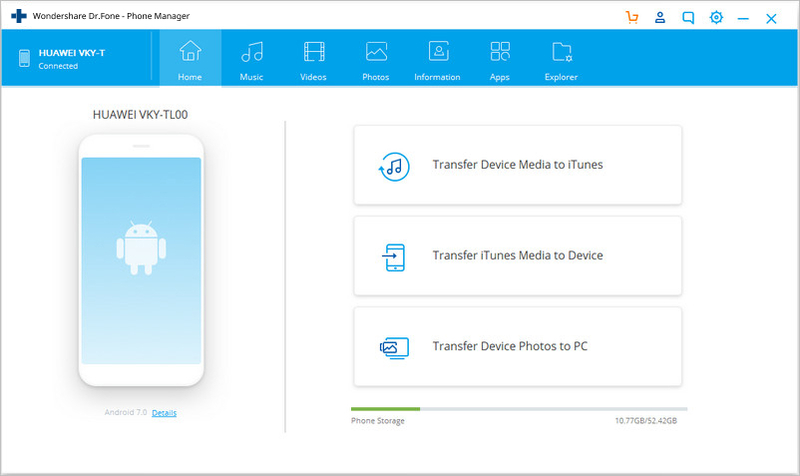 In this article, we will provide some solutions to fix Android File Transfer Mac not working and how to connect/transfer Android to Mac successfully. This article shows you top 3 software to do Android USB file Transfer conveniently. Now you can transfer files between Android and PC fast. There many apps that can be used to transfer music from android to iphone and we will cover 10 of the best ones. Many own an Android phone and Mac OS PC, but there hardly exist reliable tutorials to sync Android with Mac. 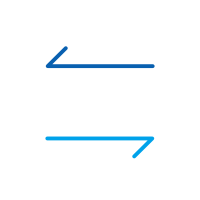 This article collects main ways of android and mac sync for light and heavy data to help. A tutorial on how to easily transfer/export photos to Google Pixel and Google Pixel XL Google phone with Google Pixel Transfer tool. Tired of MoboRobo and want to find an alternative? The article shows you a top list of 5 MoboRobo alternatives. Basically, there are 2 ways to copy music from iTunes to flash drive. This article tells you how to copy iTunes music to flash drive easily and accurately. The article shows you two ways to delete text messages on Android phone. Read it and choose the best way to do the Android SMS deletion. We will talk about the Samsung S8 price in different countries and on different online platforms and its features.All the latest info are here.